← Women and Crossword Construction, Part 1: Why the underrepresentation? It’s here! American Crossword Puzzle Tournament time is here! If you’re interested in following the standings as they develop, start checking http://www.crosswordtournament.com/2014/index.htm beginning on Saturday afternoon. My “training” for this year’s ACPT consisted of doing the occasional cryptic, variety puzzle, or variety cryptic, as well as arranging my social schedule for the weekend in Brooklyn. My goal is to have a grand time and remain in the top 30 while feeling as little stress as possible. Oh—and I’d like to get through the seven tournament puzzles without an error. I shan’t hazard a guess on who’s going to be in the finals, other than Not Me. Hope you see many of you at the tournament! Matt, pannonica, and Gareth are covering for me on most of my weekend puzzles (thanks! ), and other Team Fiend members who are ACPTing have already written up some of our weekend contributions. Themeless puzzle with a three-part quasi-quip-theme/asymmetrical quasi-minitheme? 15a. [TV show that debuted on 11/3/93 (and start of a parent’s distressed cry? )], THE NANNY. 39a. [TV show that debuted on 9/22/04 (middle of the cry)], LOST. 43a. [TV show that debuted on 1/5/70 (end of the cry)], ALL MY CHILDREN. Now, usually “cry” in a crossword clue means “shout” or “sound emitted by an animal. (Is there such thing as a sheep’s cry or a cow’s cry?) Here, it really would be a tormented, sobbing cry. Probably that nanny is going to get fired. Possibly also prosecuted. Sort of grim, no? Reminds me a hair of three past themelesses (see comments here) with triple-stacks of long answers that make up a plausible sentence (Byron Walden, 2005 NYT, ON THE OPEN SEA / FRANCIS X BUSHMAN / FELT A LITTLE LOST; Harvey Estes, 2006 NYT, AL AND TIPPER GORE/CAME TO THE RESCUE/ONE WAY OR ANOTHER; and Peter Gordon, 2010 Fireball, with a 14/15/15 stack of Mike Krzyzewski / crusaded against / Central Scotland). It’s nuttier to have your sentence in a stack than to have three answers of varying lengths in separate areas, no? Likes in Matt “Dr. Fill” Ginsberg’s puzzle: quaint FLAGON (a bottle), delicious SCHADENFREUDE, okay NOT GREAT, HAZMAT SUIT (which, speaking of Byron W., was once partnered with baseball’s KAZ MATSUI in, I think, his NY Sun puzzle), and pretty LODESTAR. Unfond of TALI ERSE ECTO REBOTTLE (reflagon!) KETT ENISLE SST RLS ETTE ESSE ALIA. [Like many washing machines] clued TOP-LOADING – not ours! We’re a front-loading family. I understand that they use much less water and energy to wash clothes. [1982 film with the tagline “They’re here”] was POLTERGEIST – I read that the “polter” part means to make sounds in German, so these are the noisy types of ghosts. [Communal dining event] clued POT LUCK MEAL – ah, the gods of crossword symmetry are cruel. It’s either a “pot luck dinner” or just a “pot luck.” Not happy with meal here. I also enjoyed the longer entries DRAMEDY and VISHNU as well as the playful [They may go on a pantry raid] clue for ANTS. Given the saber-rattling in the Ukraine recently, MAKES WAR was a solemn foreboding. Today’s puzzle is a stunt puzzle. Like the recent one by Chen/Horne it features a giant letter. Bruce’s puzzle is however nearly the opposite of that aforementioned one: instead of each answer having an H, no answer has an E. There is a revealing answer, MISSING, whose clue, [What this grid’s big symbol is, Across and Down], I found clumsy and probably unnecessary. Note that Bruce was also half responsible for the puzzle with the kite in it in the NYT earlier this week… He must like drawing pictures in his black squares! The grid is asymmetrical, 42/73, with 3X15 letter answers and 33X3 letter ones. Still, although, the 15s were kind of meh (but a bit interesting in that they were 15 letter no-E answers), there were a few interesting and/or fresh bits to be found: POWCAMP; OKAYGUY, which seemed implausible to me when it remained unfilled and had accumulated 3 Y’s in its answer; PUSSYCATS clued as [Innocuous sorts]; BALIHAI. One problem with the grid’s assymetry is uneven filling difficulty, with some very big swathes of white and some much more confined areas. Among those 33 3-letter bits, a couple were particularly irksome. I’m going to accept AAU if it’s something familiar to Americans; ICS however is not a crossworthy answer in my opinion. 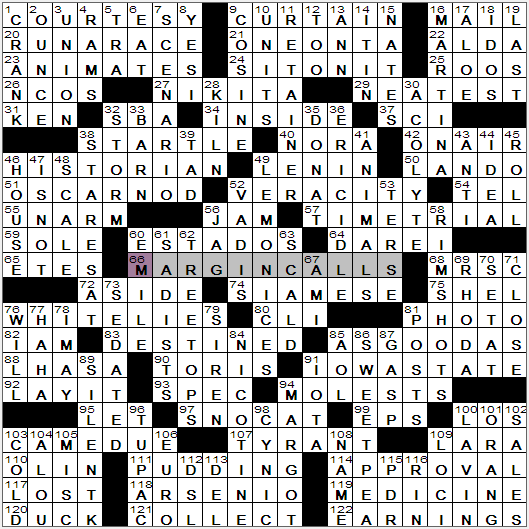 As a crossword puzzle, somewhat fun: 2.75 Stars. Neat little scientific theme, probably suggested by the revealer: 62a [Phenomenon observed in receding galaxies … and in the answer’s to this puzzle’s asterisked clues?] RED SHIFT. Briefly, as objects recede the associated frequencies become longer; this is manifested visually as its colors shifting toward the longer end of the spectrum. Conversely, as objects approach, a blue shift occurs. The aural analogue of this phenomenon is the Doppler effect (think of a passing ambulance siren—the sound becomes higher pitched as it approaches and the frequency lowers after it’s gone past). Appropriately, the theme answers contain colors in the visual spectrum—in order—but those have been replaced with the “next” color down the line, closer to red. No need to get into artificiality of seven spectral colors. Incidentally, I feel in this instance it might have been better to call the asterisks “stars,” considering the invocation of galaxies in the explaining clue. 17a. [*Duke Ellington classic] MOOD BLUE (from Indigo). 21a. [*Best-selling Canadian beer in the world] LABATT GREEN (from Blue). 37a. [*2011 superhero film] THE YELLOW HORNET (from Green). 54a. [*Commercial directory] ORANGE PAGES (from yellow). Logically, one would expect the original final answer to have been something like the soft drink Orange Crush, but it becomes apparent that it’s a revealer only and not also part of the theme. Besides, were that the scenario then there would be no place where the nature of the theme is explicit—RED would only be implied. So it’s a conundrum. On the clunky side, there probably should have been one more theme entry, encompassing violet. Honestly, indigo should have been elided (Newton used seven to better harmonize with musical notes). Handsome long non-theme entries, and quite long they are: THIRD PERSON, BUSY SIGNALS. Remainder of the ballast fill seems non-objectionable. Good puzzle, though I found the theme execution to be slightly problematic. 1a. [Telemarketer’s communication, euphemistically] COURTESY (CALL). 9a. [Acknowledgment of applause] CURTAIN (CALL). 16a. [Letter distribution on base] MAIL (CALL). 19d. [Late-night bar cry] LAST (CALL). 45d. [It involves many raised hands] ROLL (CALL). 71d. [Narrow escape from disaster] CLOSE (CALL). 102d. [A successful one results in an order] SALES (CALL). 122a. [Teleconference eagerly awaited by analysts] EARNINGS (CALL). 121a. [A prison inmate may make one] COLLECT (CALL). 120a. [Sound from the blind] DUCK (CALL). A hunter’s blind. 103d. [Junior broker’s duty] COLD CALL). 76d. [Where many a ticket is dispensed] WILL (CALL). 46d. [Medical rarity these days] HOUSE (CALL). 1d. [Bart Simpson gag] CRANK (CALL). Fourteen short and medium theme answers, not counting the revealer. A number of them are couched in explicitly financial/business terms, as befits the puzzle’s venue. Have to confess that it took me quite a while to suss out the theme, though in my meager defense I didn’t arrive at the grid’s center until late in the game. Realized there was something going on with answers that didn’t seem quite right for their clues, but my contemporaneous thoughts were restricted mostly to the possibility of rebus squares. Also, I didn’t immediately notice all the “funny” answers were located on the grid’s edges. Nevertheless, there were still a few that seemed off. For instance, 55a [Take piece to make peace?] for UNARM doesn’t quite work for me, with the poor syntax. 23a [Draws a laser gun?] for ANIMATES is also a bit much. On the other hand, 46a [Good person to ask “What happened?”] HISTORIAN is great. Elsewhere, the fill is uneven, with a mix of highs and lows, good and bad cluing, et cetera. But in general it’s at least average, and the fun theme is a plus. This entry was posted in Daily Puzzles and tagged Bruce Haight, Jeff Chen, John Lampkin, Mary Lou Guizzo, Matt Ginsberg, Patrick Jordan. Bookmark the permalink. NYT was an unpleasant experience and largely a trivia quiz in my view. Good luck to all the competitors at the tournament. NYT: I had the opposite reaction, enjoyed it very much — probably because I put in SCHADENFREUDE first! I’d just thought yesterday that I’d like to use that in a puzzle, on re-reading mysteries like Reginald Hill’s “Recalled to Life” and Colin Dexter’s “The Remorseful Day”. Define “trivia”. Vocabulary is trivia. Every answer is a test of your knowledge, one way or another. I like trivia. I also liked today’s puzzle. I experience SCHADENFREUDE reading your post. In Brooklyn after a tough shock realizing how cold it is here. I live in Florida (in Marco Rubio’s district, unfortunately, whom we here call “Hispanic” and not “Latino” as in today’s NYT) and it was 80 degrees when I left. In the 20s in Brooklyn when I arrived. Even though I intellectually knew what the difference in temperatures was going to be, it was crazy! Does anyone know if one can go to the ACPT Sunday morning and pay right then to see the final showdown? Didn’t realize I’d be in town until recently. Alex, according to information here, you can get in at 11 a.m. on Sunday for $30. This looks like it will be a lot of fun! Thanks George. Didn’t see the Paypal option at first. slightly off-topic, but: I’m interested in trying the ACPT puzzles online for the first time. The site tells me when each puzzle gets released; once they are released, are they online forever, or are they only up during the weekend or something? Am I the only one who quickly wrote in “Conjugal Visit” for 27 A: Guilty Pleasure? 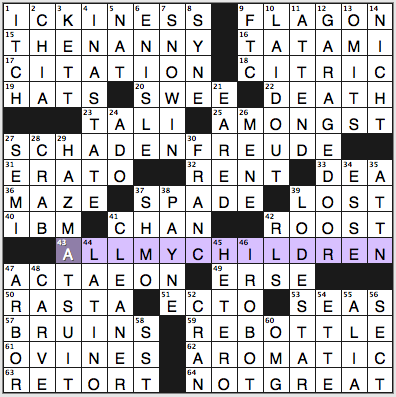 NYT: I knew I’d heard the phrase “THE NANNY / LOST / ALL MY CHILDREN” before. Since it was familiar to me, I thought it was a thing. Reading Rex’s and Amy’s review, without any mention of it being a thing, I thought I was going crazy. Turns out I had heard it before. 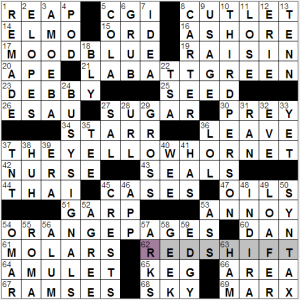 On NPR’s Sunday Puzzle back in January of 2012, Will issued a challenge to listeners to combine TV show names in a humorous way. There were some really creative, good entries. The winner? None other than the phrase in today’s puzzle. The author? None other than…Patrick Berry. Now, does Mr. Berry own his “creation”? Did he hand it off to Mr. Ginsberg? Did Mr. Ginsberg steal it outright? Is it actually theft? Inquiring minds want to know. Follow this link to see other honorable mentions in the contest. I stole it — with Will’s permission. So the issue is murkier still! I like that it was explicitly stolen! I hope Patrick Berry sees it as a great compliment! I listened to the show with the link you so kindly provided. My understanding from listening was that the Patrick Berry who came up with this line was not the well-known constructor. NYT – puzzles like this one send me towards the Rex Parker camp in terms of the qualitative decline of the institution. At least Matt Gaffney will have something worthwhile today. The 3 show joke was quirky enough to be amusing, and I appreciated it for its variety! I think it doesn’t come across as grim, only because it is supremely unlikely to occur! My other big highlights were HAZMATSUIT plus its clue and the the clue for CHAN too! I had a great deal of difficulty in the NW corner. I should have known Etta Kett, but couldn’t remember it for a long time and was focused on the military rather than the police for officer’s “gift.” The rest went smoothly, I thought it was a great puzzle. 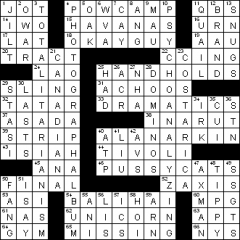 When I was creating puzzles mostly for my own enjoyment, although I did get one published by the NYT, I frequently copied a concept that was the theme in my all-time favorite puzzle, a Thursday that had four 11-letter synonyms for bragging, including the great word, JACTITATION. I never did get one that was anywhere near as good, but I created several puzzles that were in the same general family as SCHADENFREUDE, including one that revolved around synonyms for MELANCHOLIA, including WELTSCHMERZ. I have always wondered why certain languages are replete with words that revolve around sadness and pain (German) or various degrees of haplessness (Yiddish) (schlemiel, schlimazel, schmuck, schmendrick). I wonder if there is a concept that is unique to English. NYT: I struggled with it because I don’t keep up well enough with movies and TV shows, and this was strongly reliant on both. And it had a vibe– not only with the Nanny losing the children, but also it starts with ICKINESS ends with NOT GREAT with SCHADENFREUDE in the middle and DEATH somewhere in there. You put it all together and there isn’t a lot of joy in that little square– except for the one ray of light– LODE STAR. I was also surprised that SECT was clued as an ending, in a corner where there were already way too many prefixes and suffixes. Well, now I’m sounding negative. Must be catching. To redeem myself: I liked the cluing of ETTE and RENT and the FLAGON on top of the TATAMI mats… that makes a pretty picture. 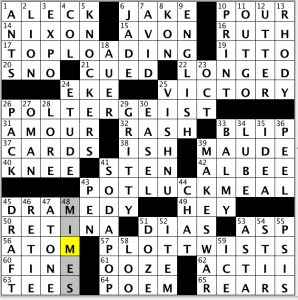 I also felt the NYT was lackluster – I just recently started doing crosswords again (after 20 years of, you know, that life thing). I am usually about 50% on getting the Friday completed (albeit a tad slower than Rex and Amy and well, everyone) but the NW corner just gave me fits – ickiness? pretty much sums up the puzzle. That being said – this site has been a fantastic resource and I thoroughly enjoy the comments and am wishing all of you at the ACPT to have a great time this weekend. LAT – There aren’t any E’s in the clues either, à la Saturday April 23, 2011, Michael Wiesenberg. Few dupes either. In the LAT, not only are there no E’s in the grid or clues, every letter except E appears in the grid and clues. Also, the grid is not asymmetric. It’s symmetric over the horizontal centerline (the x-axis, if you will). So plase explain why a three part ‘quasi-theme’ is not a theme? I agree Gareth the best part was the clues were not too clunky without any e.
Mostly loved the NYT except that the lower left was too hard for me. It was funny that Ginsberg was daring enough to start with ICKINESS and end with NOT GREAT, but this puzzle was a fun one for me. Loads of movie references, yum. The clue for 41a (Jackie with action chops), for CHAN, was great, and I loved putting in Alexander PAYNE (38d). Good to hear from SWEE’ Pea (20a), and for me TATAMI mat (16a) is always an Ozu movie reference. I, ROBOT (46d) was nice, but I admit I’ve never seen that or The Shining. I can always do with a bit of SCHADENFREUDE (27a), but don’t feel that way about me, please. Like 52d CRAN-, a nice misdirect from all-too-common computer clues. Liked 26d MENE, as a reminder of where I learned it, from a Bible comic from Classics Illustrated when I went away to summer camp that once in my life when I was eight.